We pondered the point of the mid-engine 2020 Chevy Corvette; new details emerged on the 2021 Ford Bronco and its design; we drove the 2020 Land Rover Range Rover Evoque. It's the Week in Reverse, right here onMotor Authority. 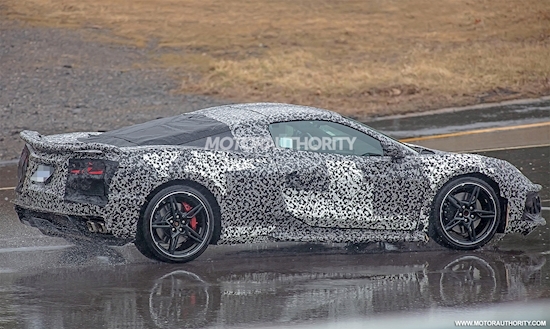 Is there really a point to the mid-engine 2020 Chevy Corvette? Given how good the current model is, we wondered aloud why Chevy needs to revolutionize its banner sports car and move the engine from the front to the middle. Sources claim dealers were shown the 2021 Ford Bronco at a dealership meeting this past February. Good news: it supposedly has a retro design that should make enthusiasts happy. It's also rumored to pack removable doors and a removable hardtop. We drove the 2020 Land Rover Range Rover Evoque in Greece. The exterior may feature a softer design, but the off-road intentions are no softer. Ford announced the 2020 Escape compact crossover will debut on April 2 with a teaser photo. Spy shots indicate it will likely take styling cues from the new Focus that we won't get in the U.S. Aside from turbocharged engines, we also expect hybrid options. Finally, the camera eye caught the 2020 Audi RS 6 Avant testing in new spy photos and video. The hot wagon was spotted at the Nürburgring testing an aggressive front fascia and larger intakes. We're still hoping that Audi will bring the RS 6 Avant to the U.S. this time.